At Bespoke Unit, we’re generally fond of Connecticut shade-grown leaf as well as the subtle and creamy experiences they offer. Therefore, we were pretty excited about trying the Julius Caesar Newman Double Connecticut! The Double Connecticut earns its name by featuring the broadleaf in both the wrapper and binder. Made in the Estelí PENSA factory, the Brick House line has seen a veritable renaissance since it was reintroduced in 2009. JC Newman’s Brick House has a distinctively Connecticut shade grown wrapper with its pale café latte texture. The wrapper has a rich sheen of oil with very mild and subtle veins. It also appears to be very well rolled with a nice, even consistency and firm spring when pinched. As for the aromas, the body mostly gives of notes of bay leaf. Meanwhile, the foot reveals a tantalising combination of citrus and bay leaf. As with all our reviews, we smoke at least three cigars before the final write-up. However, in this instance, we nearly finished the box! As you’ll learn, the JC Newman Brick House is a very pleasant smoke indeed. As mentioned above, both CP and I have sampled our fair share of Brick House cigars and we’ve come to appreciate the excellent construction. Not once have we experienced tightness in the draw and it’s frequently provided just the right amount of resistance. Meanwhile, the aromas of the cold draw are complex and varied with notes of cedar, hay as well as citrus. Compared to other Connecticut shade cigars we’ve reviewed, The Brick House begins as a remarkably complex experience. The overall accord can be likened to a think and creamy peanut butter with a hint of citrus. With a little concentration, I can pick out individual notes of aforementioned peanut as well as butterscotch. On the retrohale is where I mostly identify the citrus, which is reminiscent of sweet lime juice. As for the palate stimulation, I feel a pleasantly sweet sensation on the front of the tongue while the front and rear lateral sections experienced some sensation. I experience some salivation at the back with a little astringence near the front. While still retaining a creamy characteristic, the second third develops to have a more pronounced overall nuttiness. Firstly, the peanut drifts towards the forefront with a slight bitterness that is reminiscent of the skin when removed from the shell. Meanwhile, there’s a mild note of walnut while white pepper dominates the retrohale. With regards to tongue stimulation, it has edged further up the palate but still can be felt on the front. It is less prominent on the lateral rear section and salivation is reduced. White pepper continues to dominate the retrohale without becoming overly bitter. As for the peanut, it is still somewhat present but has very much fallen into the backdrop in favour of a more coffee note that I’d liken to an earthy espresso. However, the greatest change was the presence of a thick honey note and a return of lateral rear tongue stimulation. Between the increased salivation and sweet honey, the final third was really rather pleasant and easily smokable until you burn your fingers. The Brick House Connecticut features a medium-strength backbone, which reveals its white ash and cools the smoke nicely. As for the burn angle, it varies but tends to be only slightly waving with a surprisingly thick burn line. The overall temperature of the smoke is quite cool, which renders the Brick House a very pleasant and refreshing cigar. Its draw is consistency light without any tightness issues. Finally, the smoking time for the Robusto was somewhat shorter than expected at between around 70 to 80 minutes on average. However, being a Connecticut, you can push considerably this by taking longer pauses between draws. As a mild and creamy cigar, I would expect the Brick House to go well with a coffee. Admittedly, this isn’t a beverage that I enjoy. However, CP said that it went nicely with a café au lait. Personally, I would enjoy this with a Diet Coke for an overall refreshing experience. Otherwise, care should be taken not to try and accord the Brick House with anything that’s too strong as you’d likely lose much of its subtle character. However, I’d consider a Kentucky Bourbon to be an ideal candidate. CP informed me that he tried one with a Woodford Reserve and found the pairing to be spectacular! The Brick House is delivered in a very attractive and ornate green box. I’m quite fond of J.C. Newman’s old Americana branding and vintage US flags can be found all over the box and cigars. 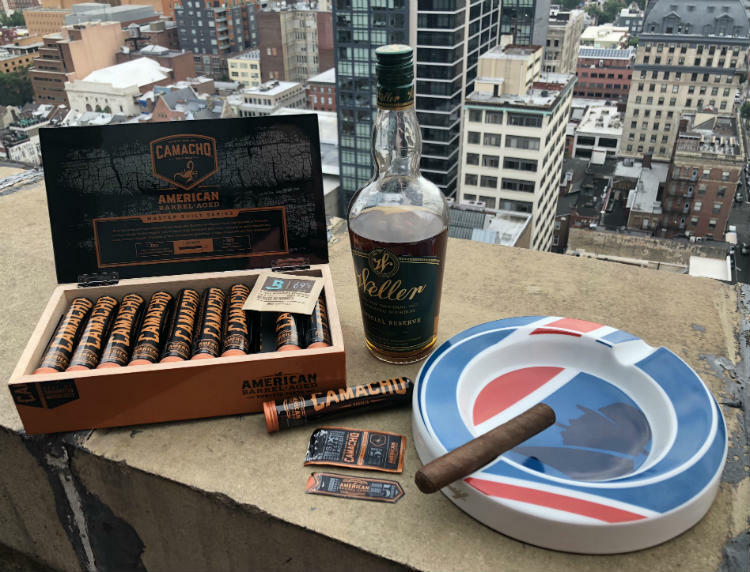 Similarly, the cigar features two bands: The main Brick House one uses the same logo as the box while a retro US flag wraps the foot. As both CP and I have proved, the Brick House is a very versatile cigar that can effectively be smoked any time. They’re ideal for the morning as well as the afternoon but milder palates may enjoy them in the evening with a sip of bourbon. While not something I’d reserve for special occasions, the Brick House is a great choice to casually share with friends. In terms of value for money, a box of Robusto cigars features an MSRP of $155, which comes to $6.20 per stick. Personally, I think this offers excellent value for money and they’re often reduced via online retailers. With its excellent construction and complex yet mild experience, the Brick House Double Connecticut is a very pleasant cigar indeed. Whether you’re a beginner or a seasoned enthusiast, you’ll likely discover something through this blend. Overall, this is an excellent daily smoke and we’d highly recommend it over a number of other Connecticut blend cigars that are currently on the market. Reviewed by Paul Anthony, on 11th March . "A mild albeit complex experience. Wonderfully refreshing with subtle nuances, this is a worthwhile cigar to add to your collection."